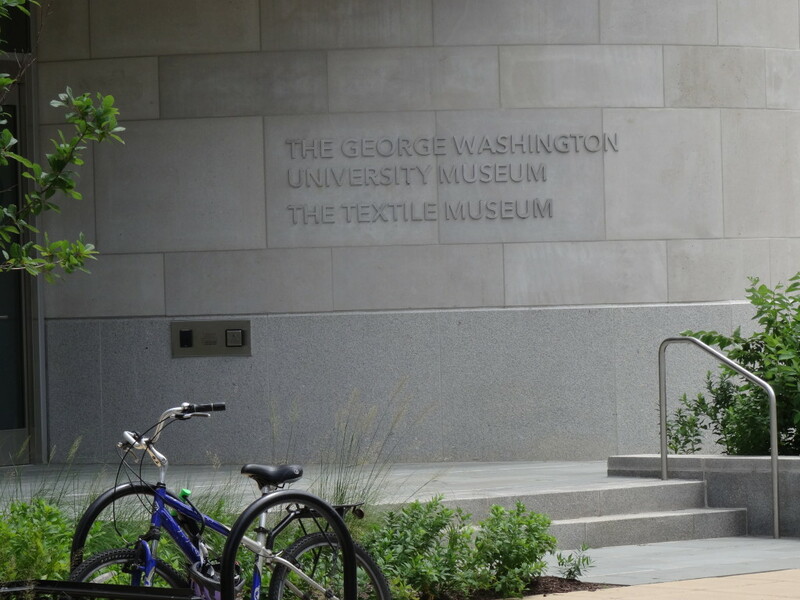 If you live in or near Washington, D.C. or have plans to visit, make time to see The Textile Museum in its new digs at George Washington University (GWU) in Foggy Bottom. 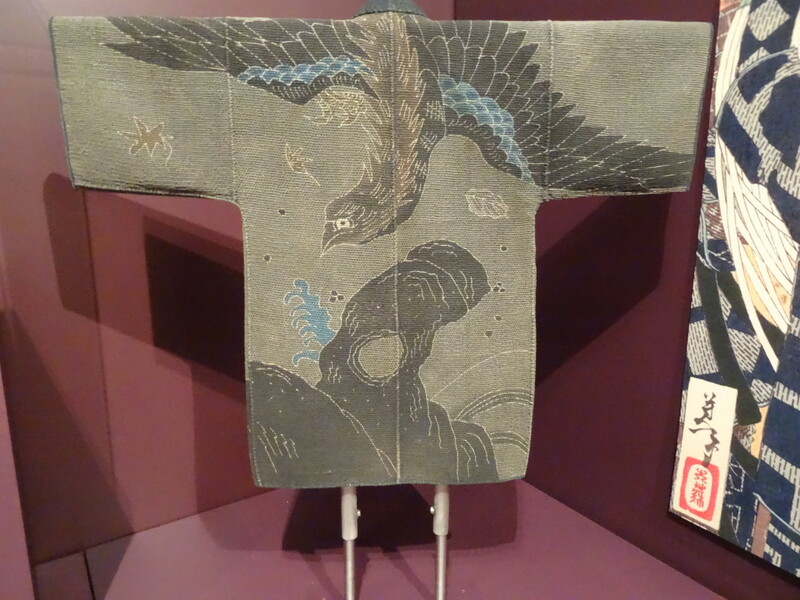 This museum specializes in indigenous non-European textiles and has a large Asian collection (though very little sakiori, as is unfortunately the norm). 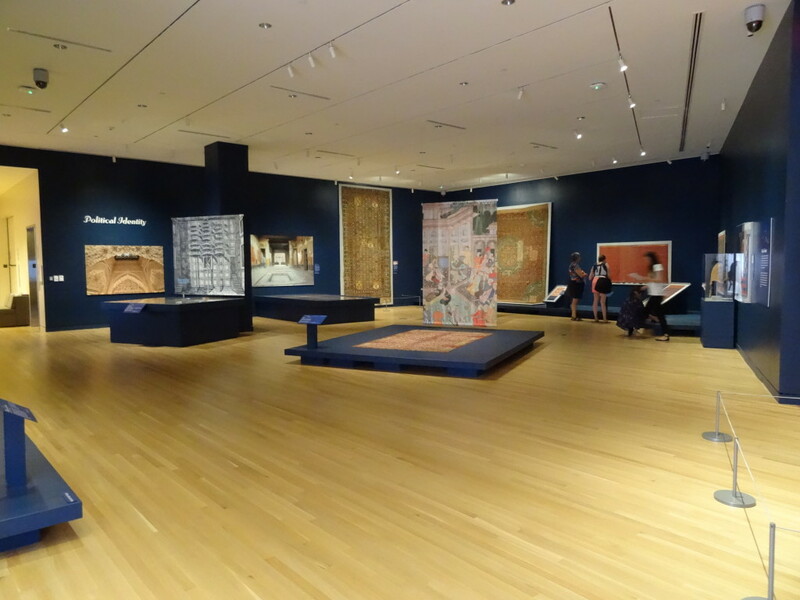 However, what you see when you go entirely depends on their exhibition schedule, as only a small part of their collection is on display at any given time. 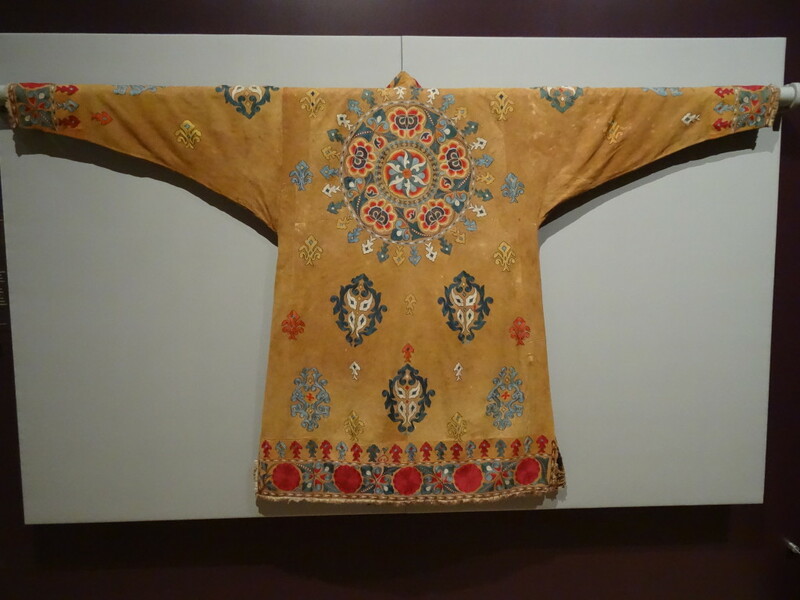 Due to the delicate nature of textiles, items are allowed to be on exhibit only six months out of every five years. 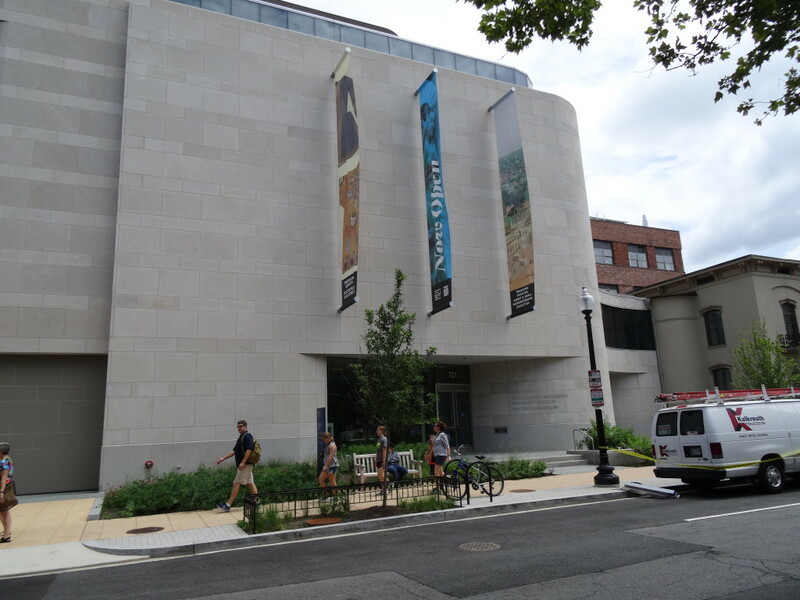 When I visited in July, the museum had just celebrated its grand re-opening after joining with GWU and moving into its new facility. It is located a short walk from the Foggy Bottom/GWU Metro stop and is close to the White House and its nearby monuments and memorials, as well as the Smithsonian and the Capitol. 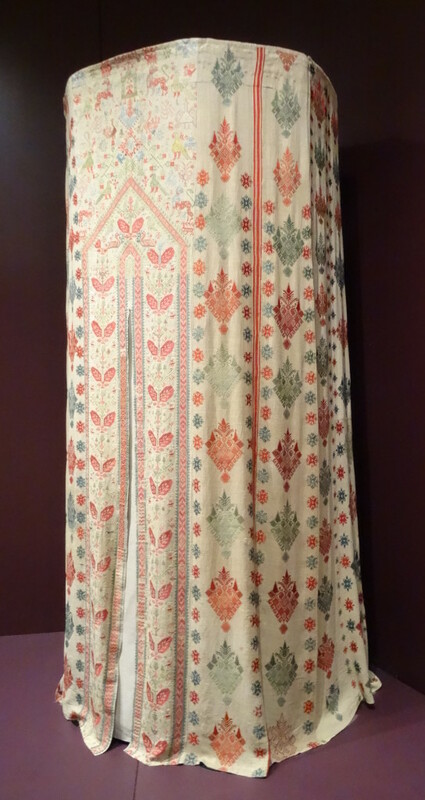 Likeminded textile enthusiasts might be interested to know that I combined my visit there with a short Metro ride to the National Museum of the American Indian, another very worthwhile fiber-y destination. 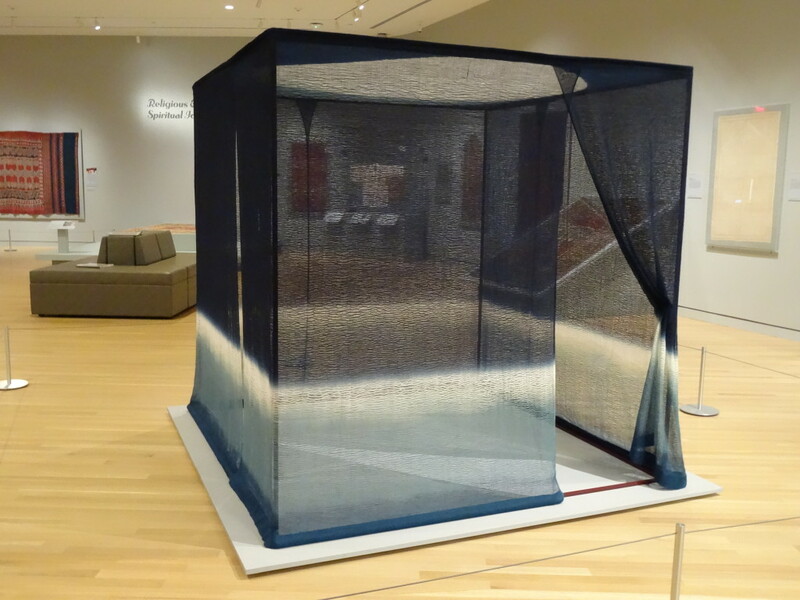 The museum’s opening exhibit was entitled “Unraveling Identity: Our Textiles, Our Stories” and ran from March 21 through August 9, 2015. It was an opportunity for the museum to use its new space to display many of their best items from many different cultures in a way that had been difficult for them in their previous quarters in side-by-side houses. The new space has three floors of open exhibit space that can be arranged with movable units to accommodate any size of items. 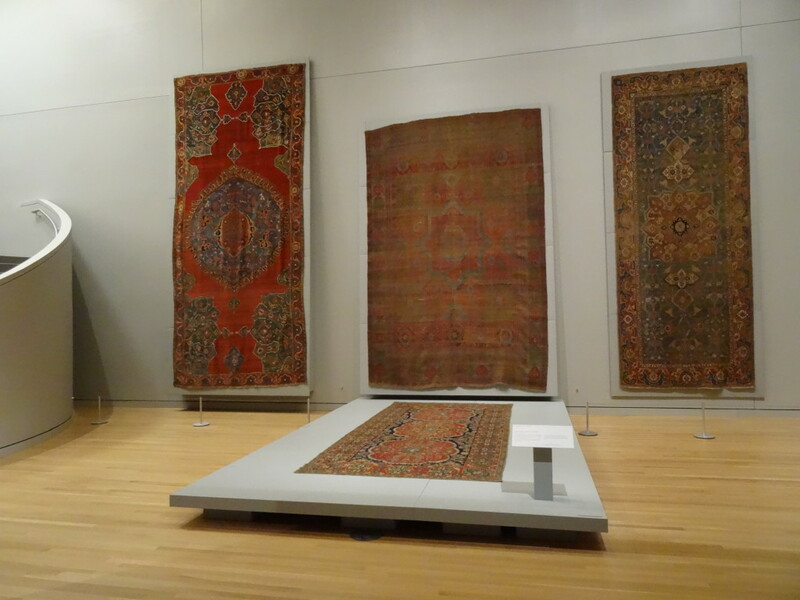 In the new location, large items, like these room-sized carpets, can be displayed with ease. 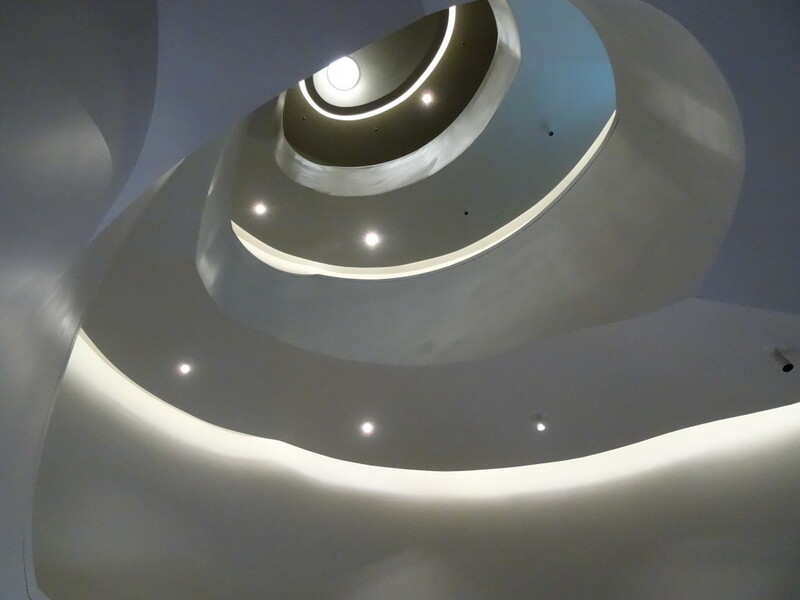 The most striking architectural feature of the new building is the interior staircase linking the exhibition floors. 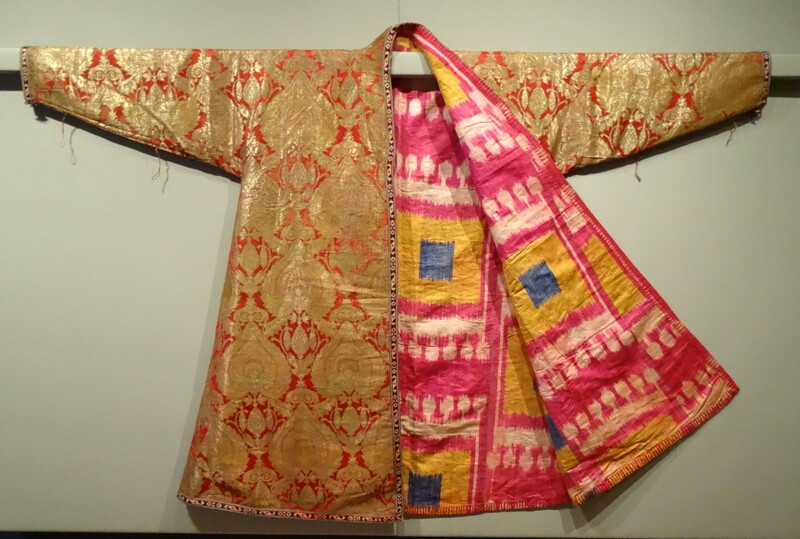 The “Unraveling Identity” exhibit was an engrossing and fascinating look at an array of beautiful textiles from many cultures. 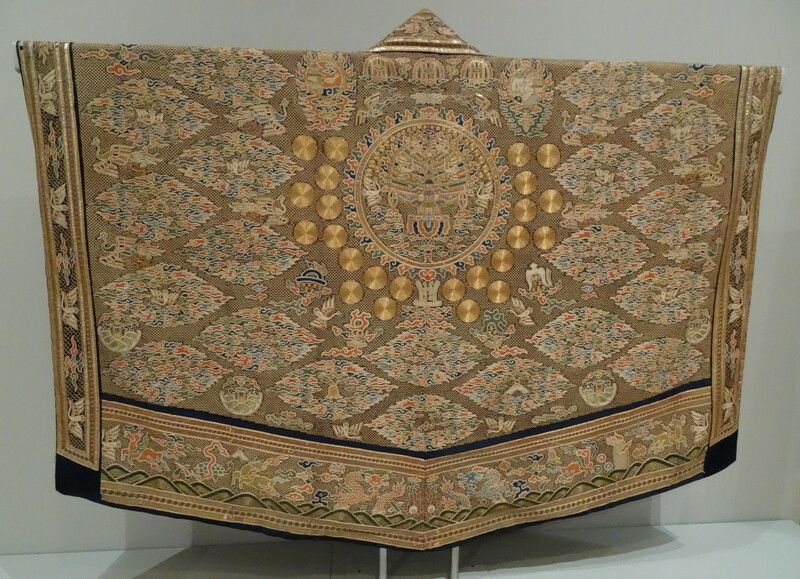 Bed tent, Greece, Dodecanese Islands, Kos, 17th-18th c.
Mans coat, Uzbekistan, Tashkent, second half of the 19th c.
Serung [Hip wrapper], Peranakan, Indonesia, Java, Pekalongan, 19th c.
Ikat-lined robe, Uzbekistan, Bukhara, late 19th c.
Firemen’s jackets were made of layered and densely sashiko-stitched cotton, which was doused with water before fighting fire. As a former volunteer firefighter, I have a special interest in firefighting gear and techniques, and, as a Japanese textile enthusiast, this one is right up my alley! 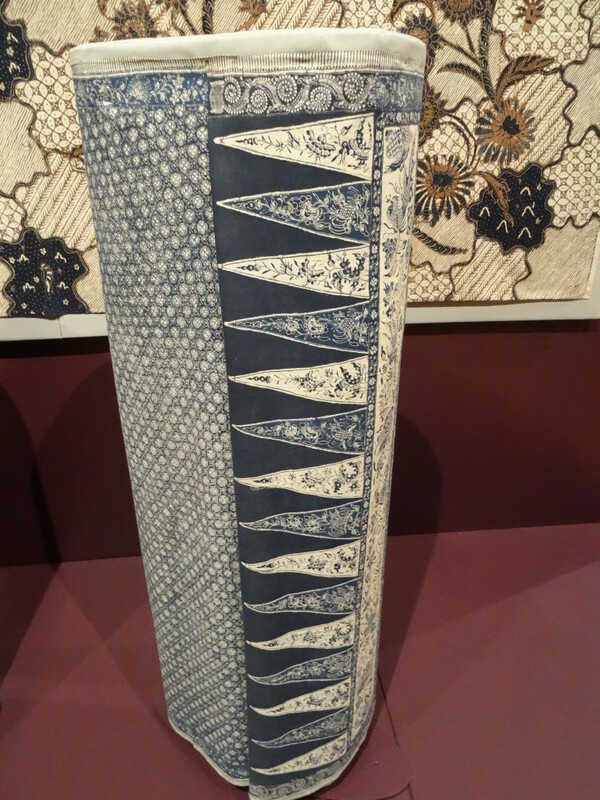 I am amazed when I see these fireman’s jackets because the sashiko is truly so tightly packed and regular that it is difficult to distinguish that they are embroidered on the cloth and not actually warp or weft threads in a rag-woven cloth. Auspicious designs on the inside of the jackets were displayed during festivals or after the fire had been vanquished, as a symbol of celebration and victory. Look for my article about The Textile Museum in the November/December 2015 issue of Handwoven magazine, with better (i.e. not taken by me!) photos and more details about the museum’s history and the move to its new location.